Great things sometimes come in small packages. That’s certainly true in the lab of Eun Ji Chung at the University of Southern California, Los Angeles. Chung and her team each day wrap their brains around bioengineering 3-D nanoparticles, molecular constructs that measure just a few billionths of a meter. Chung recently received an NIH Director’s 2018 New Innovator Award to bring the precision of nanomedicine to autosomal dominant polycystic kidney disease (ADPKD), a relatively common inherited disorder that affects about 600,000 Americans and 12 million people worldwide. By age 60, about half of those battling ADPKD will have kidney failure, requiring dialysis or a kidney transplant to stay alive. For people with ADPKD, a dominantly inherited gene mutation causes clusters of fluid-filled cysts to form in the kidneys that grow larger over time. The cysts can grow very large and displace normal kidney tissue, progressively impairing function. For Chung, the goal is to design nanoparticles of the right size and configuration to deliver therapeutics to the kidneys in safe, effective amounts. Our kidneys constantly filter blood, clearing out wastes that are removed via urine. So, Chung and her team will exploit the fact that most molecules in the bloodstream measuring less than 10 nanometers in diameter enter the kidneys, where they are gradually processed and eliminated from the body. This process will give nanoparticles time to bind there and release any therapeutic molecules they may be carrying directly to the cysts that cluster on the kidneys of people with ADPKD. Chung’s research couldn’t be more timely. Though ADPKD isn’t curable right now, the Food and Drug Administration (FDA) last year approved Jynarque™ (tolvaptan), the first treatment in the United States to slow the decline in kidney function in ADPKD patients, based on tests of the rate of kidney filtration. Other approved drugs, such as metformin and rapamycin, have shown potential for repurposing to treat people with ADPKD. So, getting these and other potentially life-saving drugs directly to the kidneys, while minimizing the risk of serious side effects in the liver and elsewhere in the body, will be key. Most FDA-approved nanoparticle therapies are administered intravenously, often for treatment of cancer. Because ADPKD is chronic and treatment can last for decades, Chung wants to develop an easy-to-take pill to get these nanoparticles into the kidneys. But oral administration raises its own set of difficulties. The nanoparticles must get from the stomach and the rest of the gastrointestinal tract to the bloodstream. And then if nanoparticles exceed 10 nanometers in diameter, the body typically routes them to the liver for clearance, rather than the kidneys. While Chung brainstorms strategies for oral administration, she’s also considering developing a smart bandage to allow the nanoparticles to pass readily through the skin and, eventually, into the bloodstream. It would be something similar to the wearable skin patch already featured on the blog. In the meantime, Chung continues to optimize the size, shape, and surface charge of her nanoparticles. Right now, they have components to target the kidneys, provide a visual signal for tracking, enhance the nanoparticle’s lifespan, and carry a therapeutic molecule. Because positively charged molecules are preferentially attracted to the kidney, Chung has also spent untold hours adjusting the charge on her nanoparticles. But through all the hard work, Chung and her team continue to prove that great things may one day come in very small packages. And that could ultimately prove to be a long-awaited gift for the millions of people living with ADPKD. As kids, most of us got a bang out of blowing soap bubbles and watching them float around. Biologists have learned that some of our cells do that too. On the right, you can see two cells (greenish yellow) in the process of forming bubbles, or plasma membrane vesicles (PMVs). During this blebbing process, a cell’s membrane temporarily disassociates from its underlying cytoskeleton, forming a tiny pouch that, over the course of about 30 minutes, is “inflated” with a mix of proteins and lipids from inside the cell. After the PMVs are fully filled, these bubble-like structures are pinched off and released, like those that you see in the background. Certain cells constantly release PMVs, along with other types of vesicles, and may use those to communicate with other cells throughout the body. This particular image, an entrant in the Biophysical Society’s 2017 Art of Science Image Contest, was produced by researchers working in the NIH-supported lab of Jeanne Stachowiak at the University of Texas at Austin. Stachowiak’s group is among the first to explore the potential of PMVs as specialized drug-delivery systems to target cancer and other disorders . Until recently, most efforts to exploit vesicles for therapeutic uses have employed synthetic versions of a different type of vesicle, called an exosome. But Stachowiak and others have realized that PMVs come with certain built-in advantages. A major one is that a patient’s own cells could in theory serve as the production facility. Caption: Snapshot of changes that occur (black) when surfactant molecules are stressed by carbon nanoparticles. For the less spectacular “before” image, click the “Continue reading” link. 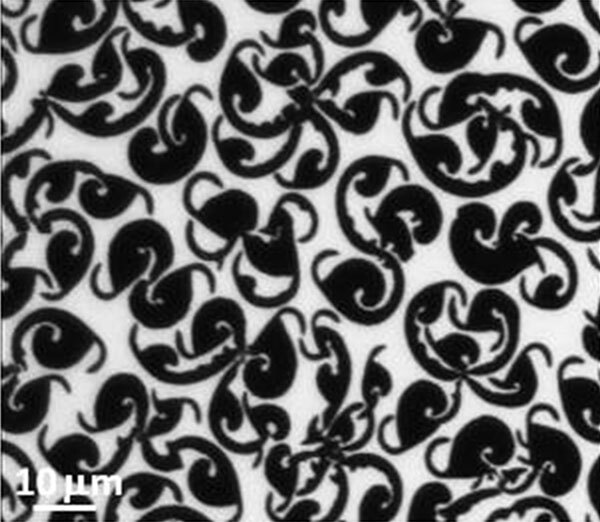 These eye-catching spirals may resemble a trendy print from Diane von Furstenberg’s Spring Collection, but they’re actually a close-up of lung surfactant—a lipid-protein film that coats the inside of the air sacs in the lungs, making it easier to breathe. Made using fluorescence microscopy techniques, this image shows what happens to the surfactant (black) when it interacts with carbon nanoparticles. Scientists found that carbon nanoparticles rearrange the surfactant molecules from kidney bean shaped clusters into solid spirals. Since carbon nanoparticles may be effective drug delivery vehicles, it’s important to know how these molecules alter the surfactant—and whether these changes are harmful. The verdict is still out on whether disrupting the surfactant triggers breathing problems, but we can still be mesmerized by the image.